Abstract: UPDATED with new support bracket details. The Noctua NH-C14 is a big heatsink for sure, but remarkably by orienting the fans and aluminum fin stack in a top-down direction, Noctua keep the heatsinks' height to just 130mm. That's a far cry more compact than your typical 160mm tall tower heatsink, but that hasn't made the NH-C14 into a slouch. The Noctua NH-C14 is a big heatsink for sure, but remarkably by orienting the fans and aluminum fin stack in a top-down direction, Noctua keep the heatsinks' height to just 130mm. That's a far cry more compact than your typical 160mm tall tower heatsink, but that hasn't made the NH-C14 into a slouch. Where Frostytech's Intel LGA775/1156 thermal test platform is concerned, the Noctua NH-C14 heatsink leads the Top 5 Heatsinks Chart. The competition is a little stiffer on the AMD front with the NH-C14 trailing the front runner by about 2.2°C. 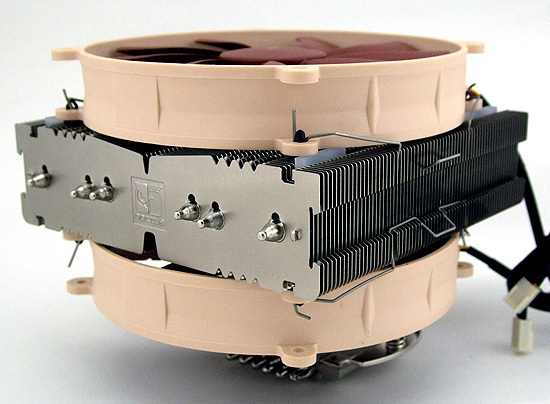 One of the unique aspects of the Noctua NH-C14 heatsink is it can be made even more compact by removing one of the two 140mm diameter Noctua NF-P14 fans. Either to reduce its height to 105mm or alternatively to raise its clearance over nearby motherboard components like the RAM. The two 140mm Noctua NF-P14 vaneaxial fans that ship with the NH-C14 feature SSO bearings, vortex-control notches and elastomeric rubber mounting pads - all in an effort to reduce noise. Weighing 1000 grams with both fans, the Noctua NH-C14 processor heatsink has a relatively boxy footprint of 151x166mm. It's six, 6mm diameter copper heatpipes fan out from the copper base plate into nickel plated aluminum cooling fins, all joints are soldered good thermal conduction. Both 140mm fans are held in place with easy to use wire fan clips that engage with small rubber mounting grommets. The fans rest against clear elastomer strips that give proper spacing from saw-toothed aluminum fin edges and also work to isolate the cantilevered heatsink's fins from vibration-generated by the fans. A good thing since the NF-P14 fans can create a slight oscillation in the upper portion of the NH-C14 heatsink. Materials: Nickel plated aluminum fins, copper heatpipes, copper/aluminum base. 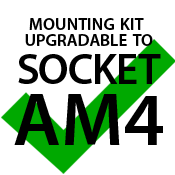 MOUNTING KIT UPGRADEABLE TO SUPPORT AMD SOCKET AM4? Noctua state: "Owners of Noctua CPU coolers can obtain the Noctua NM-AM4 SecuFirm2 Mounting-Kit free of charge via this form. A proof of purchase (electronic version, photo or scan of the invoice) of both a Noctua CPU cooler and either a socket AM4 mainboard or socket AM4 CPU are required. There is a dedicated upgrade kit (NM-AM4-UxS) available for NH-U14S, NH-U12S and NH-U9S"
For more details, heatsink exceptions and a complete list of incompatible coolers, see here. Noctua NM-AM4 SecuFirm2 Mounting-Kit supported on following Noctua heatsinks Frostytech has tested: NH-C12P , NH-C14 , NH-D14 , NH-D15 , NH-D9L, NH-L12, NH-L9x65, NH-U12 , NH-U12P , NH-U9, NH-U9B . Noctua NM-AM4-UxS Mounting-Kit: NH-U14S, NH-U12S and NH-U9S. Before you ask, to support the mass of heat exchanger and fans Noctua have tucked in a steel support rod. It's bolted to the base of the heatsink and wedged in between the aluminum fins with a layer of clear elastomer. The steel support rod is worth mentioning because we've seen plenty of top-down heatsinks arrive for review after being drop-kicked by Fedex - resulting in the upper unsupported section of the heatsink slumped over like a co-worker that's had one too many drinks at the Christmas party. In most cases the heatsink survives, in some cases the heatpipes or one of the internal wicks crack. Processor compatibility is broad, the Noctua NH-C14 heatsink installs onto Intel socket 775/1155/1156/1366 and AMD socket AM2/AM3 processors, be they single, dual, quad or six, eight or more-core chips. Note that the Intel socket 1156 and socket 1155 motherboard mounting hole spacing is identical, so 32nm Sandy Bridge Intel Core i3/i5/i7 2xxx-series processors will work with this CPU cooler. The whole package retails for about $85CDN ($85USD / £44GBP) through the usual nine online retailers. UPDATE: Noctua have released a metal support bar to provide additional stability to the upper half of the NH-C14 heatsink and address the concerns about a slight oscillation that Frostytech noted in its initial review. The metal bar is fixed to the base of the heatsink and supports the fan against a pair of soft rubberized tips. According to the Noctua rep, the bracket "will be provided free of charge to customers who experience any such issues. We'll probably also include this with the cooler in the future or add additional bracing to the heatsink itself." On a side note, Frostytech can think of only one other thermal solutions company that revises its heatsinks based on end user feedback this quickly. The retro-fit support bracket and screws. To ensure good thermal conductivity the joints between the copper heatpipes and nickel plated aluminum fins are soldered. That begs the question; what's the thermal conductivity of the solder used to make this heatsink? Without knowledge of the solder type used in the NH-C14's production we can't say definitively... but just like thermal interface materials, different solder alloys offer levels of thermal conductivity - some more, some a lot less. There's a good article on electronics-cooling.com that goes into detail on the subject of thermal conductivity of different solder alloys that we recommend for further reading. The chart below breaks it down clearly. The most common solder used in heatsink manufacture in pre-RoHS days was Tin-Lead (SnPb), it has a thermal conductivity of 50 W/mk which we'll consider the baseline average to go by. In these post-RoHS manufacturing days Lead is most definitely out, so it's quite possible the Noctua NH-C14 heatsink has been fabricated with low melting temperature Bismuth-Tin (BiSn) solder that has a relatively poor thermal conductivity of 19 W/mK... but unlikely. Given the colour of the solder joint we'd guess that Noctua have selected one of the Silver based solder alloys - perhaps Tin-Silver (SnAg) or Tin-Silver-Copper (SnAgCu) for example. Solder has a higher thermal conductivity than thermal compounds, but a lower thermal conductivity than the unalloyed metals used in heatsink construction. For comparison's sake, Aluminum and Copper have thermal conductivities of 247 W/mK and 398 W/mK respectively. Good quality thermal compound generally has a thermal conductivity of between ~1W/mK and 4 W/mK, which is why it's so important to apply it sparingly! Noctua's NH-C14 heatsink is compatible with Intel socket 775/1155/1156/1366 and AMD socket AM2/AM3 processors. The CPU cooler ships with a variety of brackets, separated into packages for AMD and Intel processors. For either CPU socket family small metal tabs must first be attached to the motherboard (with a backplate) then the heatsink itself fixed in place. Noctua mounting brackets use a common set of spring-tensioned screws that are bolted to its base to make this process quite straightforward. In the image below you can see one of the two specially placed holes in the overhanging aluminum fins that allow easy access for the supplied screwdriver to the mounting screws below. The two 140mm fans need not be removed, in most cases the screwdriver will pass between the fan impellers without interference. Both fans come pre-installed on the heatsink and rest on clear elastomeric anti-vibration strips. Fans may be removed by unhooking the wire fan retention clips that lock into the side of the aluminum fins. Little rubber studs keep the clips locked into the fan frame and a small tab makes the wire easier to get a hold of. A small syringe of thermal compound is included, along with a screwdriver and in-line resistors that decrease the speed of the NF-P14 fans. The blue fan speed resistor reduces fan speed the most, the black connector reduces fan speed about half way.